If you are beginner or experienced user in 3D design, you can try some of these 3D Modeling Softwares. When choosing, you need to find one that is easy to learn and use. In general, the commercial 3D softwares are expensive; however there is a lot of software which can be downloaded for free. Most of 3D Printers require that you use graphics software that saves objects in the STL (stereolithography) format. Google SketchUp - This Google SketchUp is fun and free, and is known for being easy to use. To build models in SketchUp, you draw edges and faces using a few simple tools that you can learn in a short time. With with Push/Pull tool you can extrude any flat surface into a 3D form. Furthermore, it works together with Google Earth, that you can import a scaled aerial photograph directly from Google Earth, or use SketchUp to build models which can be seen in Google Earth. 3DTin is a browser based 3D modelling tool, that provides a simple user interface to create 3D designs. Users can create 3D objects by putting together cubes of different colors. The goal of 3DTin is to provide as intuitive user interface as possible for the task of 3D modelling. So the obvious question is, why should it need a "User’s Guide"? Good question. The simplicity of 3DTin is aimed at getting user started as easily as possible. The toolbars and cursor cues make sure that adding, removing cubes come as obvious actions when the user first visits the app. More features unveil subsequently. But there are some advanced tips and techniques that are not apparent readily. This guide is to document those not-so-obvious features. Blender - Blender is a free and open-source 3D computer graphics software product used for creating animated films, visual effects, art, 3D printed models, interactive 3D applications and video games. Blender’s features include 3D modeling, UV unwrapping, texturing, raster graphics editing, rigging and skinning, fluid and smoke simulation, particle simulation, soft body simulation, sculpting, animating, match moving, camera tracking, rendering, video editing and compositing. Alongside the modelling features it also has an integrated game engine. OpenSCAD - OpenSCAD is a free software application for creating solid 3D CAD objects. It is not an interactive modeler, but rather a 3D-compiler. OpenSCAD reads from a script and renders a 3D model from it. OpenSCAD is available for Windows, Linux and OS X. It does constructive solid geometry (CSG). OpenSCAD can also extrude forms from AutoCAD DXF files. The results can be rendered into 3D STL files. TinkerCAD - TinkerCAD is a browser-based 3D solid modelling tool for rapid prototyping known for its simple interface and entry-level ease of use. Microsoft 3D Builder – 3D Builder is a fun, easy to use, free app for Windows 8.1 that helps you turn digital objects into physical ones and explore the exciting world of 3D printing. It also includes a library of example 3D objects to get you started. 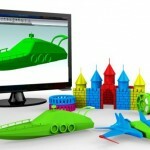 3D Builder has a catalog of objects you can create from ornaments to toys and more. The clean, simple user interface lets you scale, rotate and adjust what you want to print. Add multiple objects to a single print – even stack or push objects into one another to create new ones. Printing 3D objects created in other applications or ones that are downloaded from the Internet is really easy with the 3D Builder app and touch as well. Autodesk 3ds Max® – 3ds Max® 3D modeling software provides a comprehensive modeling, animation, simulation, and rendering solution for games, film, and motion graphics artists. 3ds Max delivers efficient new tools, accelerated performance, and streamlined workflows to help increase overall productivity for working with complex, high-resolution assets. Autodesk AutoCAD – AutoCAD is a commercial software application for 2D and 3D computer-aided design (CAD) and drafting — available since 1982 as a desktop application and since 2010 as a mobile web- and cloud-based app marketed as AutoCAD 360.